You want to talk about instant sensations? Less than a year after Charlie Chaplin's 1914 film debut, he was one of the most popular entertainers in America and the country had caught a acute case of Chaplinitis that would linger for decades. Demand for his films was so intense he easily parlayed his initial $150/week acting contract into a much-publicized “million dollar contract” in 1917 and soon his own studio. His Tramp was probably the most recognizable fictional figure of the early 20th century, and Chaplin is frequently described as one of the first international film stars. Chaplin himself was keen to point out his trail to glory had already been blazed by Max Linder, the French-born star who Chaplin once described as his “professor.” Linder had a similarly meteoric rise to fame, making his screen debut in 1905 (after several years honing his craft in live theater), premiering his urbane “Max” character (a dapper figure with top hat and cane whose slapstick exploits generated even more laughs from their incongruity with his apparent suavity) in 1908, and signing a “million franc” contract in 1912. Max was instantly recognizable to European audiences and was at the very height of his popularity in the years immediately preceding the Tramp's arrival on the world stage. 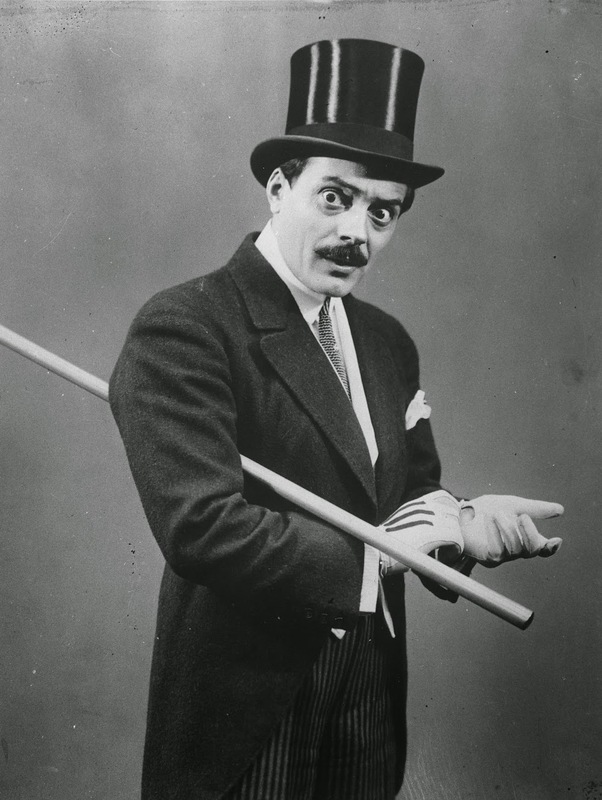 Max wasn't entirely displaced by the Tramp as there was plenty of room for more than one draw at nickelodeons and other theater houses, but Linder heeded the siren call of an American studio that wanted a competitor to Chaplin. The career gamble was mostly a failure as American movie-goers weren't quite as enchanted by the “sophisticated slapstick” of Linder's European dandy-about-town, preferring the more knockabout exploits of Chaplin and peers. While moving back and forth from France to America over the next several years, the star was never able to regain his former dominance. Linder also battled severe depression during this period, a battle he would lose in 1925 when he and his young wife committed suicide in Paris in 1925. The films on Kino Lorber's “The Max Linder Collection” do not represent Linder at his commercial peak, but provide strong evidence that his less lucrative films of the 1920s merit a place of pride in his often-overlooked legacy. “Seven Years Bad Luck” (1921, 64 min.) spins the kind of thin narrative line upon which Linder liked to string his inventive gags and set-pieces. Linder (playing a character with his stage name) is engaged to be married, but fears an ill fate when he breaks a large mirror in his room. In his effort to avoid any risky situations, he generates nothing but risk. The film features one of the earliest instances of the oft-copied mirror gag (two actors ape each other's movements through both sides of an empty mirror frame) and a lengthy chase scene (consuming much of the final half hour) that begins on a train and ends in a lion's cage at the zoo. Linder is not quite as gymnastic as either Chaplin or Harold Lloyd, but his combination of determination and ingenuity spark the action and the laughs in a film that cannily pays only the slightest attention to plot-based needs. “Be My Wife” (1921, 58 min.) is somewhat more burdened by story and suffers for it. Max competes for the hand of the lovely Mary (Alta Allen) with the portly Archie (Lincoln Stedman). Some of the film's best bits involve Max trying to avoid Archie's pesky dog (though viewers might have concerns when the poor dog gets tossed out a window) but it bogs down in a series of irritating miscommunications that advance the shopworn plot to its inevitable conclusion. It's the least successful film on the set, at least to my taste, but still of interest if for no other reason than the fact that the beefy Stedman is a mere fourteen years old here but looks and plays a completely convincing adult. Tall, thin, stern-looking Caroline Rankin also cuts a unique and memorable figure as Mary's judgmental, protective aunt. “The Three Must-Get-Theres” (1922, 57 min.) 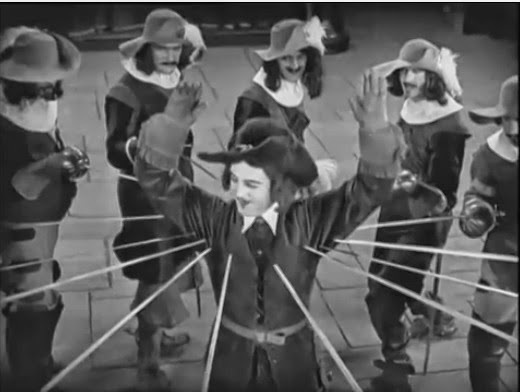 sees Linder, eager to connect with American audiences, dropping his signature character and donning period garb as the not-so-dashing Dart-In-Again in a parody of Douglas Fairbanks Jr.'s smash hit “The Three Musketeers” (1921). Dart-In-Again spends the first reel trying to mount a donkey (oh get your mind out of the gutter) and repeatedly kissing his very clingy father goodbye before stumbling (sometimes literally) into royal court intrigue and battling the evil forces of Cardinal Richie-loo. There are some nifty bits of slapstick and swordplay, but the film is most successful as a send-up of the macho movie hero; I laughed hardest at a scene when the overconfident Dart-in-Again bursts in to a room to present his professional credentials with the line: “Here's a letter from my daddy.” The period movie is loaded with intentional anachronisms (phones, motorcycles, a reference to the NYC subway) and gleefully showcases it silliness as men dispatched by the deadly blade of Dart-in-Again keep moving and even speaking after their deaths. The humor is broader than any barn side and no less satisfying for it. The disc also includes one short film, “Max Wants a Divorce” (1917, 27 min.) The short was one of Linder's first American flops, but has its merits. Max is newly married, but receives notice of an inheritance that requires him to be a bachelor. After bribing his bride (Martha Mansfield) with a pearl necklace in order to go along with his scheme, he arranges to be caught cheating so they can divorce and later re-marry after he cashes his inheritance check. Jealousies and general incompetence prevent a simple plan from falling to pieces, and some of the ensuing mayhem is quite amusing if not exactly inspired. The copy on the back of the DVD case (housing the single disc that contains the three features and one short) states that the films have been “meticulously restored from archival materials.” Unfortunately, the only information regarding these restorations is presented as pre-credit notes for two of the films. “Be My Wife” was restored in 2008 by Lobster Films in collaboration with Fondazzione Cineteca Italiana, Milano from two original nitrate color-tinted prints with addition digital restoration in 2014 by Lobster Films. The original American version of “The Three Must-Get-Theres” disappeared and this edition was restored in 1995 by Stiftung Deutsche Kinemathek from a nearly complete copy in the Netherlands Filmmuseum with supplemental material from the collection of filmmaker Gerhard Lamprecht. English titles were adapted from a German release. As you would expect with silent films over ninety years old, even restored versions are far from flawless. Of the two that clearly indicated as restored, “Be My Wife” is the strongest with only a few scenes (esp one where Mary goes to a clothing store) showing significant wear. “The Three Must-Get-Theres” displays minor damage in many shots, vertical scratches or white/dark splotches on the print, but it still holds together fairly well overall. “Seven Years Bad Luck” may be the best looking of the bunch with only relatively minor wear visible throughout. “Max Wants a Divorce” is in much rougher shape than the other three, looking like a well-worn print in various states of deterioration from scene to scene. The action is still clear but the image is soft in most shots. Still, it's a wonder it survives at all. The films are each accompanied by relatively recent scores: “The Three Must-Get-Theres” by Maud Nelissen, “Be My Wife” by Eric Le Guen, “Seven Years Bad Luck” by Robert Israel, and “Max Wants a Divorce” by Donald Sosin. Obviously the music is the only sound for these silent films and the Dolby Digital mix presents the various scores clearly and without distortion. Unfortunately, Kino Lorber has not included any extras, opting to save room on the single DVD for the 205 minutes worth of films in the set. 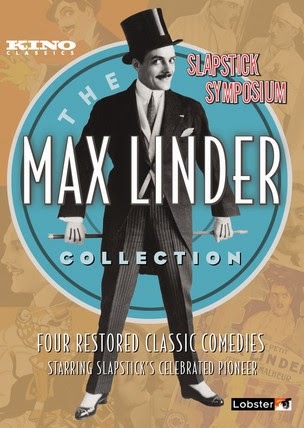 A booklet or a text feature on the disc with more information about the restorations and/or background on Max Linder would have been nice, but then again I guess that's what the Internet is for. Before Chaplin, Keaton, and Lloyd, there was Max Linder. One of the very first superstars of cinema, his fame has been eclipsed by the comedians for whom he helped pave the way, but this collection from Kino Lorber provides viewers a taste of his American-produced films. Since Linder was best known to audiences for French short films, this set doesn't showcase him in his popular prime, but the films certainly show off his wit and talent. I had a lot of fun “discovering” one of the true titans of silent cinema with this set, and I hope you will too.